If you haven’t been in Jerusalem in the past year or so, you’ll notice a new, modern addition zooming through parts of the ancient city. 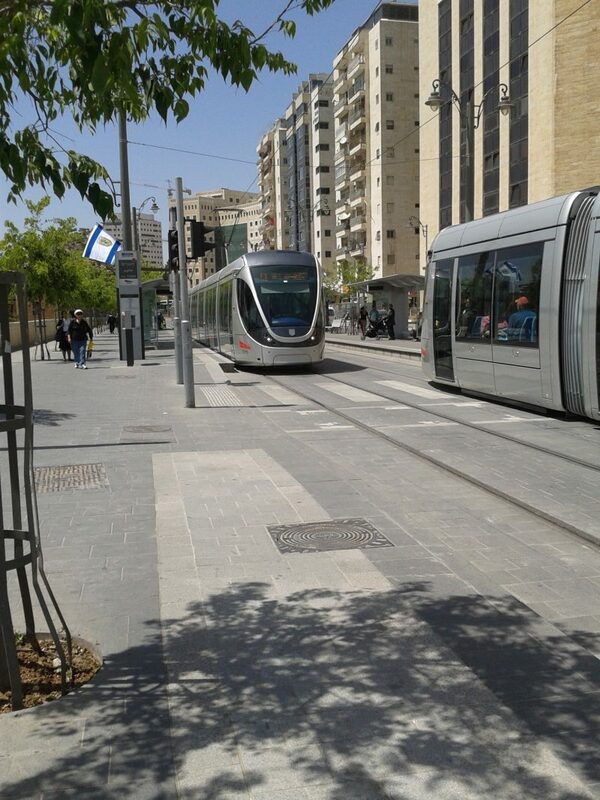 That’s the Jerusalem Light Rail. And while residents of the city have been grumbling and moaning about the construction and mess for the past several years, the light rail finally started running in the summer of 2011. So long- buses stuck in traffic! Central Bus Station (Tachana Hamerkazit in Hebrew) is how Jerusalemites get all around the country, from Eilat to Haifa. The light rail stops right across the street. Two stops later (heading northbound) is Mahane Yehuda, aka, the shuk. The open-air market is a popular tourist spot, and the train stops just outside the Yaffo Street entrance to the shuk. Two stops later is “Yaffo Mercaz,” better known as the center of town. 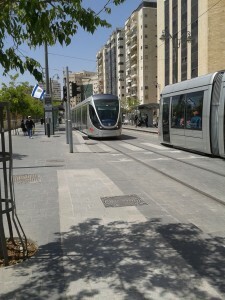 The light rail stops right at the corner of Yaffo and King George streets, just a few steps away from Ben Yehuda Street and other popular downtown locations. It’s also a 10-minute walk toward Me’a Shearim. Yet another two stops past the center of town is Sha’ar Shechem, just outside the Old City of Jerusalem. The smooth ride can be a fun trip from start to finish to get a nice view of the city. You'll also travel over the newly constructed Chords Bridge, or Bridge of Strings, just past the Central Bus Station near the entrance to the city, whose highest point rises nearly 400 feet in the air. But you may not want to just get out at any stop: the train also goes past the Shuafat refugee camp and the mostly Arab neighborhood Beit Hanina – so it's important to keep aware of your surroundings! Scroll down below for an interactive map of the system! You just step right on. The light rail cars are wheelchair accessible and stroller friendly, unlike the bus routes around the city. At every train station, there is an automated machine that will enable you to buy a ticket with cash or credit card for the light rail. Citizens and long-term residents generally own a “Rav Kav” bus card, which they can load with whatever plan they like, but tourists must buy a one-time ticket for (at the time of writing) NIS 6.60. You must buy a ticket before getting on the train. Upon boarding, look for the two ticket accepting machines that are posted next to each door. Feed your ticket (the right way!) in to the slot and wait for the machine to spit it back out. Hang on to it for inspectors! Rav-Kav users just press their card on the front of the machine. How many times can I ride the train on that ticket? As many as you want… 90 minutes from the time of purchase. The same applies to all bus routes (and vice versa – bus tickets can enable you to ride the train (if you ask the bus driver for one that’s valid on the light rail): don’t feed it in to the machine, just hang on to it in case of an inspector.) While all this information is true, there have been numerous reports of light rail inspectors claiming tickets are not valid for all rides. Be prepared to argue (and welcome to Israel). Does the light rail run 24/7? Nope! 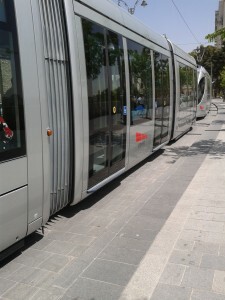 In addition to not running on Shabbat or holidays (stopping about an hour before it starts and starting up again about an hour after it ends), the Jerusalem Light Rail runs from 5:30 a.m. to midnight (the times that the final train leaves each end point). During peak rush hour, every 6 minutes, otherwise every 9-15 minutes depending on the time of day. Each station has automated screens that announce how far away the next train is.